Friday night $5 (CASH) to get in, pay your way Saturday Night $10 (CASH) EAT BEFORE YOU COME - CLASS PICTURE $20 BRING YOUR OWN DRINKS - IF YOU FAILED TO ORDER A T-SHIRT IN THE FIRST ORDER, IF ENOUGH ORDER - BE PREPARED TO PREPAY FOR YOUR T SHIRT. $20 S-XL, $22 2X, $24 -3X, $26 -4X only available in Crew neck. We must hit 12 or more. WELCOME TEXAS HIGH CLASS OF 1983! NOTE: SATURDAY NIGHT LOCATION OF EVENT HAS CHANGED DUE TO UNFORSEEN CIRCUMSTANCES. ******Classmates will be responsible for cover charge, food and drinks at all events. *Classmates will be responsible for $10 cover charge per person, $$ CASH ONLY - NO EXCEPTIONS. This money will go toward the cost of the venue, dance floor, DJ and clean up. *Please eat before you come, some classmates will be personally bringing some finger food to be served around 9pm. It would be greatly appreciated if you would like to bring something, please text or call Julie Moreland. *NOW - GET READY FOR THIS......BYOD- Bring Your Own Drink event! So bring your own beverage, beer, wine etc. or Coke, Dr Pepper, Sprite, tea whatever suits your fancy. You buy it, you bring it, up to you to guard it or share it! Wyndham Garden Hotel: HAS BEEN CLOSED DOWN - PLEASE MAKE OTHER ARRANGEMENTS. Courtyard by Marriott, Hoiday Inn Express, Hampton Inn, Fairfield Inn, Hiiton Gardin Inn - take your pick. Booking.com - Priceline.com - Trevelocity.com up to classmates to make their own accommodations. CLASS PICTURE SATURDAY NIGHT - PICTURE WILL BE TAKEN BY 7:30PM FASHIONABLE LATE CLASSMATES - There you go, that's your deadline. If you want to be in it! If you want to purchase one, they are $20 each, PATTERSONS PHOTOGRAPHY will take prepaid orders. Pictures will be ready for pick up or be mailed within 10-12 days. If anyone is planning an after party for Friday or Saturday night, please email Julsmoreland@aol.com the information (SUBJECT LINE: AFTER PARTY) Need to know which night, location, address etc. T-Shirt will be made available to those who would like to purchase: Contact Julie Moreland 903.293.3409 to order T shirts S-XL $15, 2X $17, 3X $18 must be picked up, no mailing unless you have made arrangements with me to pay for shipping. 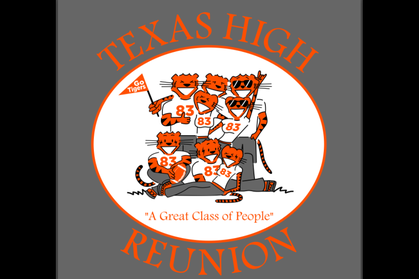 Cash or check only, Make payable to Texas High Class of 1983 - or Julie Moreland Picture of shirt(s) is on our facebook page, but I will be glad to send you a picture via text. If anyone else would like to offer service times at any other class members church, please email to Julsmoreland@aol.com (SUBJECT LINE: CHURCH SERVICE) the Church Name, address and service time. I have asked some classmates to try to contact teachers, administrators, principles, custodians any one still around that would like to come! If you CLASSMATES, want to help in this task - JUST DO IT! Rather they be contacted 2 -3 times than not at all! Note: Mr. Willigee and Mr. Nance have been contacted. Texas High for anyone that calls! Checking with Radio stations now. BUT CLASSMATES USING SOCIAL MEDIA: IS THE BEST WAY!!!! SO EVERYONE GET TO IT!!!! CLASSMATE if you are already registered, make sure your information is up to date, if you are not registered on the website and have received this notice by a forward from a classmate, or seeing it on facebook, please do so now. Go to TEXASHIGH83.com Create your log in and enter your information. If you have an email address, please enter it. We will be emailing classmates with announcements of all kinds. This is everyones voice to the Class of 83 TIGER PACK! Please spread the word, look through the list of classmates and contact them anyway you know how! We must keep looking for all of our classmates still on the missing list. It is all of our responsibility to spread the word - CLASSMATES REACHING OUT TO CLASSMATES! SO SPREAD THE WORD ANY WAY YOU KNOW HOW AND HELP FIND EVERYONE! IF ANY CLASSMATES have any get together ideas they would like to plan thorughout the years between the 35th and 40th - Please email me Julsmoreland@aol.com (SUBJECT: THS 83 Class Events in between) I will be glad to email out any information. For example: If you would like to have a Dallas area gathering, interested in a class cruise, maybe a one night gathering for anyone in T-Town and want to get classmates together spontaneously! THS-AHS football games, maybe a track meet, baseball game! Head it up and I will send it out! Thank you Kelley Wiltshire Godby, Paula Crowe Cook, Arthur Dennis Hill, Terrance and Myekye Hamilton and William Goree for being so supportive in our endevour to keep this simple & fun! LESS STRESS IS THE BEST and so are all of you! Such a Great Class of People!